I like many people am not a fan of bandwagon fans and love to point out people doing trendy stuff, then when I briefly logged on to PGA live this morning just to see if the kid caddie was going to make the cut and shut it back off it got me to thinking...holy **** I'm "Tiger effected". I realized I bought a subscription to the PGA live service mainly so I could watch him play earlier in the year and it never even crossed my mind to purchase it before, then and even worse, or better depending on how you look at it, I have gamed the same Newport for a few years and had never even given much of a thought to replacing it, I'm not an amazing putter but I'm usually in low mid 30's for putts in a round, but because of him I decided to try a mallet and it's been amazing. Now I didn't go as far as to get the TM he is using but needless to say I tried it because of him, but still as happy as I am with the results I still looked in the mirror and said....sheep...bahhhhhh. I like to at least give the trendy stuff a try because sometimes there’s something to it. Not much have I actually adopted. Tried hybrids, spider putters, super stroke grips, and probably a few other things but the only fad that has really stuck with me is my driving iron. If it works for you or you enjoy it, who cares if it's a cliche? Be a hipster, be a conformist, be yourself, whatever. Just enjoy it. I never know what is trending. Are you scripting your clothes and wearing only red shirts on Sundays? I do like to follow Tiger but otherwise the "Trends" seemed to have passed by my door. Not surprising since I play mostly hickories and vintage clubs. My "somewhat modern" clubs are almost 20 yrs old. Tiger brought a ton of new people into the game. There's nothing wrong with that. I got into golf about 10 years ago when Tiger was the biggest star going. If you were discovering golf at that point in time, you were going to be a fan of Tiger. I didn't start playing golf because of Tiger. I simply went to the range and got addicted. 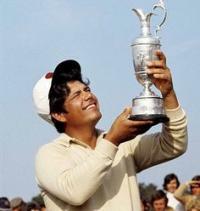 But it was awesome watching Tiger play back then. His instructional book was awesome. The ANGC Master's DVDs were awesome. And what about all the videos on YouTube!? What wasn't to like? Tiger was (and is) entertaining. There's nothing wrong with admitting that. I still love watching Tiger play even though I doubt he'll ever reach world #1 or anything like that. At the end of the day, we all follow stuff that's popular. I went through a phase like that as a musician where I didn't think it was "cool" to like anything that was too simple or catchy. Well, F that. Part of growing up is knowing what's classic and what's a fad. Tiger is one of the greatest players in the history of the game. There's no shame in filing him under "classic." 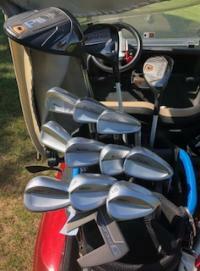 I have never seen him play in person, then again, I've only ever been to one tour event, but I would definitely like to see him while hes competitive not just to see him play but to experience the madness that goes on around him....and be thankful that I never have to try and play with that going on. Could have been the best but the best don’t forget the quest. I really don’t blame him, if somehow I had earned a billion it would be tough to be a good boy. Know a few that fizzled out in the NHL but tough to come from BF Saskatchewan and land in NY with a few million in the bank. Culture shock!!! Also know a really good one that came from BF Ont with a 26 mil contract that still drives his 8 yo F150. Sorry, way off topic here. Tiger was the reason I started playing golf, until then, I just thought golf was for fat out of shape guys that weren't athletic enough to play other sports. I started with Nike shoes, bag and woods because of Tiger. Six years later, I realized that the golf I play and Tiger or any pro plays is barely similar and that I need to play clubs that fit me, not Tiger. I play XXIO woods,SeeMore putter and Kirkland golf balls, hardly the equipment pro's play but they work for me. These days I'm more influenced by what fellow WRX'ers say about equipment than what the pro's play, which explains why I ordered a Ping G400 MAX yesterday. Tiger is the greatest golfer that ever breathed air. He's idolized the way Ruth was in baseball. You owe no apologies. Maybe there is a support group you could join.